Condos Updated plus a New Pool 2008! You will be swept away by the unique charm of Affordable Beach Condos. Every condominium has a different theme. Every condominium has a FULL KITCHEN + a private patio, pool access and use of the fishing dock! TWO BEDROOM units that sleep six. STANDARD ONE BEDROOM units that sleep four. And now we are proud to offer a THREE BEDROOM THREE BATHROOM EXECUTIVE HOUSE that sleeps 6-8. Enjoy 2400 square feet of VACATION living with a gourmet kitchen, cathedral ceilings, zoned heating/central air-conditioning and magnificent views of the water - just 30 feet from your living room. All condos are similarly appointed with all the same amenities. This island retreat consists of seven, very private, ground-floor condominiums, with no steps anywhere. 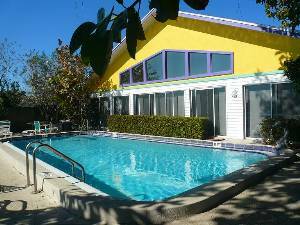 There is a heated pool with a fabulous patio overlooking the water. Attached is a fishing and boat dock that attracts all kinds of birds such as herons, egrets and pelicans. 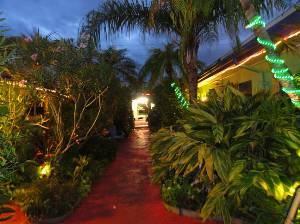 All the condominiums have been recently updated, tiled and painted while still maintaining the charm of a bygone Florida era. 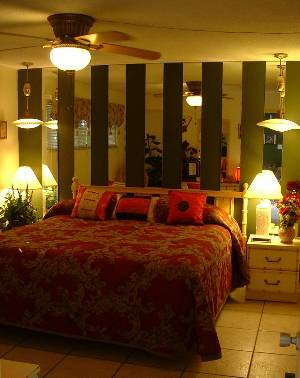 The two bedroom condominium, for example is done in a Florida Theme. The one bedrooms are similarly done with themes of Africa, Hawaii, the South West, Oriental, and English Cottage and an Art Deco them. ONLINE BOOKING at WWW....COM PLUS pictures of each unit. The bedrooms each have a queen size bed (larger than a double) and the two bedroom has a queen and two singles. Some units have a king bed. The living room also has a queen size sleeper sofa. 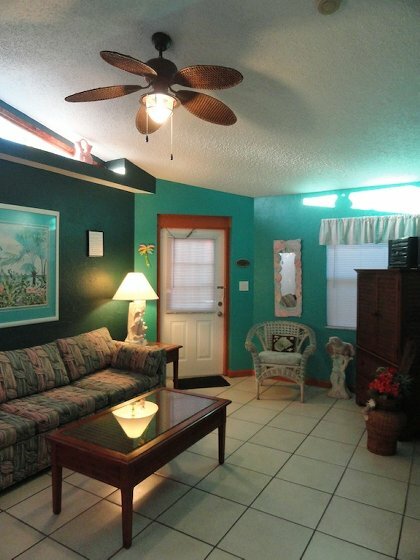 Ceiling fans, heating and air conditioning is in each unit. All these units have been recently painted, tiled and updated. There is a full size kitchen with a full size stove with an oven. 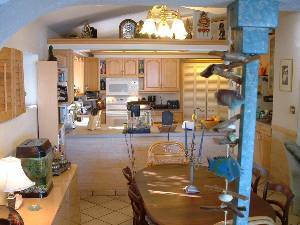 A full size refrigerator and freezer, microwave oven, coffeemaker, and toaster. All dinnerware and appliances are included plus linens and beach towels. Our pool side is beautifully sheltered by a HUGE rubber tree on one side. 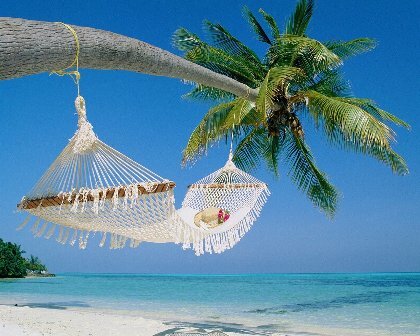 So escape the hustle and bustle of the busy beach and enjoy total privacy and quiet. You can walk to anywhere in five minutes, even to the local supermarket! We even have an historical wooden boardwalk called Johns Pass, close by. It is reminiscent of a bygone era, with its rough wooden buildings sporting fading tin roofs. They are set on stout wooden pilings, and the fishing boats dock there each evening. It is famous for its fresh seafood restaurants and lively bars. Papa Ernest Hemingway would be quite at home here! Across the road there is a day spa, and a community center with regular activities such as bingo, and jazz bands etc. There is a small park as well. Up the road, the beach has a kids play center with slides and monkey bars. At night there are dozens of nearby beach restaurants awaiting you, as well as night clubs, bars, and great shopping in our village square. There are excellent discount outlet malls within a few miles drive. 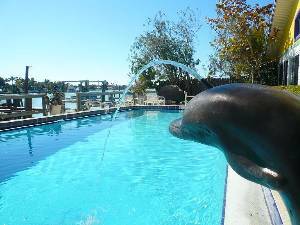 Also in the vicinity, within a short drive, there are golf courses, nature reserves, bird watching, para sailing, scuba diving, dolphin cruises, gambling cruises, and our pristine Treasure Island beaches that are ranked as the finest beaches in the USA!! You are also right on the Barrier Islands in the warm Gulf of Mexico, with 30 miles of wonderful beaches! Rates subject to change up or down without notice. One block to Shops and Restaurants. The Executive House at Whispers with the shared pool. The House has 3 bedroom 3 bathrooms and huge open plan living. This is one of the best places that me and my pups have stayed in Treasure Island Highly recommended! ...Again, thank you very much, we had a wonderful time on Treasure Island. Send our best to Sharda and your son, we and the girls really appreciated the Halloween gifts. This is just a short note to say how much we enjoyed our stay at Whispers in September. Linda and I were very impressed by the layout of Whispers and the standard of accommodation. We particularly enjoyed lazing on the deck near the pool and our attempts at fishing. We enjoyed meeting Jeff and Sharda and we are grateful for their help and advice. We found Treasure Island fascinating, interesting and convenient for visits St Petersburg and Clearwater. Thank you for a wonderful place to stay! We all had a great vacation and felt safe in your dwelling. Just a note to say we enjoyed our stay at Whispers - It went too fast, but it was great to be there during the 50th Anniversary celebration! We loved Fort Desoto and bird watching there. We didn't take any ferries, though, so we'll have to do that next time. Lindsay and I wanted to thank you for a great stay at your place. It was the perfect setting for our much needed rest and relaxation. Treasure Island and the surrounding area is a great place to visit. I loved it there as a kid growing up in Indians Rocks Beach...Hi to Leela! Just wanted to say thank you for wonderful week at your (Whispers) vacation villas. We all had a great time and the location was perfect with the beach, restaurant and arcade so close by. Have a great day! We recently stayed at Whispers Resort in Florida, 24 - 31st Jan 2005 and I must say what a great time we had. You live in a wonderful place! Now that we are back in cold, breezy Tennessee, we are grateful for the wonderful week at whispers. We will certainly recommend. I would like to thank you and Sharda very much for the hire of your condo. The kids loved the pool and watching for dolphins. It was ideal and just what we were looking for after a hectic week in Orlando, especially my wife's massage from Roz. When we are back in Treasure Island we most certainly will stay with you again. Just a note to let you know we returned safely from Florida and to thank you for your wonderful hospitality. We had a great Holiday and enjoyed sitting on your dock and watching dolphins swim by. Rented from you before and absolutely loved the condo!